Jack and I take long walks most mornings, but these walks are dependent on Jack’s riding in the stroller, or, as some call it, the “doder.” Andrew joins us on the weekends, but this morning Jack wanted to walk, not ride. We let him walk for a while, but I got fed up with the pace and tried again to coax him into riding. “Don’t you want to ride in the stroller?” I wheedled. “That way, we can go fast! And we’ll be able to go see the…” here I paused, casting about for some exciting thing we could walk to. “We could go see Place!” suggested Andrew. “Right!” I said. “Place! We can go see Place, Jack! Do you want to get in the stroller?” And in he climbed. We went on our merry way, and soon Andrew and I completely forgot about Place. And, if we had remembered about it, we would have assumed Jack had forgotten about Place as well. But about a half hour into our walk, we happened upon a house with a shed in its yard. “It’s Place!” cried Jack, pointing at the shed. As if that was not enough, I finished the day by telling him that the Sesame Street CD was sleeping. He totally fell for that one too. How do you eat YOUR chips? I am right this second going through receipts, and came across one of Andrew's from the grocery store. On 8/22/08, Andrew bought two pounds of butter and two bags of chips. And that is all. Apparently, there is also a "Fatherhood brain"
“What are you talking about?” I replied. “We both have two. I have The Charmer, you have his brother The Mischief Maker, and we both have The Youngest Girl.” The Youngest Girl is so young I don’t have a good nickname yet; her baptism was last month. Question: How does one organize fifty wine glasses in a pleasing, attractive display? Answer: One does not. One lines them up in rows by type. One also wonders what one was thinking, exactly, when one registered for twelve place settings. 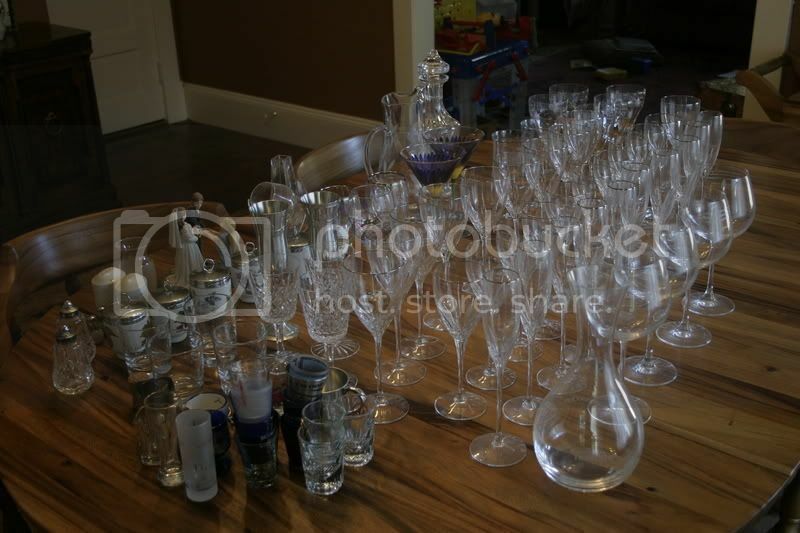 One is kind of glad, actually, that one received “only” ten each of the goblets, wine glasses and champagne flutes. One also makes plans to put about half of the crystal into storage as insurance against breakage. One may or may not get around to that sometime this decade. Question: Just when, exactly, does one ever expect to have 10 guests all drinking champagne? Answer: One does not care, because the champagne flutes are the prettiest of them all. Question: Is it a good idea to collect shot glasses from all the places one visits? Answer: It is a good idea in theory, because shot glasses are cheap, have an actual use, and you can get them at the airport on the way home. In practice, however, one may find that fifteen or so shot glasses lined up in a row gives much more of a “frat house” feel to the décor than one might wish. Oh, and as for washing the wine glasses, just do it by hand, carefully, with the soft side of the sponge. If your wine glasses have any kind of paint or metallic rim, use cold water. For what its worth, cheap glasses break more easily than fancy ones, in my experience. And now, because I am afraid I will forget about this if I don’t record it for all posterity, Jack said good bye to Andrew last week thusly: “Bye, sweetie. Bye, sweetie-toot.” Andrew and I can take credit for “sweetie” as a term of endearment, but Jack made up “sweetie-toot” all on his own. I hate registries, so when Andrew and I got married, we only registered for china and crystal. While discussing the new arrangement of stuff in the china closet, I asked Andrew if he thought it would look better with something behind the wine glasses. “But the wine glasses are behind the wine glasses,” he said. Why didn’t I blog this immediately? Something happened to Andrew some months ago, but, for some reason, I never wrote it down. Why? I can’t say. I blame motherhood. In fact, more and more often, Andrew is telling me about conversations he claims we have had, conversations in which he says I have been an active participant and not just someone saying, “Mmmhmmm” absentmindedly, but of which I have absolutely no memory. But here’s the thing: not only do I not remember the conversations, but I also do not remember having the opinions I apparently proffered. For example, today I noticed a big chunk of wood missing from the dining room doorjamb. I was annoyed, and also confused, because it is not somewhere where something would crash into it, so I don’t understand how it happened. But tonight when I pointed it out to Andrew, he said that he had already showed it to me last month and that I claimed it had been like that for ages. You know what else I blame on motherhood? My incredible inability to stay awake past 9:30 pm. Despite being very interested in watching Olympic gymnastics and swimming, I cannot stay awake. (Side note: Jack can dangle pretty well on the swing set, and – thanks to highlights On Demand – likes to proclaim, “I a gynnast!” as he does so.) The women’s gymnastic team finals are all a blur since all of my energy and focus was concentrated on keeping my eyelids at least semi-open. Last Monday, in fact, we downloaded StrongBad’s Cool Game for Attractive People, and I tried it out while Andrew took a shower. I’d tell you how it is, but I don’t know because I fell asleep. That’s right, I fell asleep while playing the game. So to recap, motherhood is responsible for my sleepiness, my forgetfulness, and my lost time. Oh, wait, I didn’t mention the lost time? Well conversations are not the only thing I have forgotten since Jack was born. I also forgot the thing that happened to Andrew some months ago, which, as you will see if you will check the first sentence of this entry, is the actual subject at hand. Andrew recently asked me why I had never blogged about it, and I had to tell him that it was because my memory of the incident had been wiped, no doubt replaced by the precise inflection and rhythm of Mr. Hooper’s verse of “I’ve Got Two”. This loss is, as you will see, a tragedy. It seems that some months ago, after watching a show on TV, Andrew tried to get up from the couch. And couldn’t. “Maureen!” he cried out, piteously. His feet, you see, were stuck between the couch cushion and the arm such that, when he tried to get up, the shift in his body weight somehow pinned his feet so that he could not get them out. But when he lay back down, he couldn’t bend his leg in the direction he needed to free his feet. So he needed me to pull the cushion back and free him from the Chinese Finger Trap of couches. In our old kitchen, we kept the spices in an IKEA “Billy” bookcase with CD inserts. We had originally thought we would put that bookcase back in the shiny new kitchen, but after we painted we realized it would look hideous, so into the outside pantry it went. Now, I had planned to go on keeping the spices in bookcase, but Andrew won’t let me because the outside pantry isn’t insulated. The spices! We must protect them from humidity and drastic changes in temperature! So instead, we have haphazardly shoved the spices into one of our cabinets, all willy-nilly, thus ensuring that we will never be able to find the spice we want at any given moment. Since our old system in the Billy bookcase allowed us to group the spices alphabetically, this new system leaves something to be desired. (Leave me alone, it was a wonderful, not-OCD-at-all system. Shut up.) So last week I went out to try to purchase some sort of organizational device to save us from our living nightmare. I had planned to buy one of those expandable step-stair shelving things like this, but Bed & Bath didn’t have any. So I mulled things over and by the time I came home I realized that the step-stair shelves would be a terrible idea, because not only would it not hold all the spices, but it would also be impossible to get at the spices in the back without knocking down all the spices in the front, causing me to scream in rage and frustration. In fact, they’d probably all fall over every time I even opened the cabinet. No, what we needed were some boxes. Stackable boxes, sized perfectly for our cabinet. We could put the spices in the boxes in alphabetical groups, and label their tops. That way, if we needed cinnamon, we could take down the “A-G” box, scan the top, and pull the cinnamon out in a snap. A snap! It was genius. Genius, I tell you! But when I explained my brilliant plan to Andrew, he was unimpressed. He thought the boxes were a terrible idea, saying that we wouldn’t be able to get at the short ones and they’d be impossible to get out of the boxes. I remained calm in the face of this clear insanity, and asked him what he suggested as an alternative. He said something about shelves or something. I don’t think I was really listening, because I was too busy thinking about how my idea was the perfect solution, and wondering what was wrong with him that he couldn’t see it? Especially when, at one point, he said that in a perfect world he’d like to have a deep drawer for the spices. When we opened it, we could look down on their labeled lids. “But that is the same as boxes!” I cried in frustration. After many agonizing minutes, I finally had to put a stop to the conversation because I was so incredibly irritated. “I got irritated ten minutes ago,” Andrew replied. And it took me the next two hours get over it. He was just so… wrong! And I was right! Right right right! And apparently, Andrew felt the same way in reverse. But here’s the really interesting part. Andrew and I have been married for almost five years, and we’ve known each other for more than ten, but this was basically our first fight. This is in part because we are both non-confrontational, but also because we so rarely disagree. We either feel the same way about something, or else one of us doesn’t really care. So it’s nice to find out that we are able to remain calm, and take that necessary step away when discussing such highly charged subjects as spice storage. Old houses have their charms like built-ins, the fancy moldings, the old, quality hardwoods, etc. But old houses have their problems as well, such as incredibly outdated kitchens and bathrooms. That and creaky floors and doors. Walk to Jack's door: Crrr-rr-rr-eeeeeeaak. Creak. Creeeeeak. Pause, listen for startled-child sounds. Grasp doorknob. Hold breath. Open the door: SNAP! POP! Crrrrrrrrreeeeeeeeaaaaaaaaaaakkkkkkk squeak squeak POP SNAP CRUNCH creeeeeeeeaaaaak! Seriously, it sounds like a novelty Halloween album in here. And yet, somehow, he sleeps through it. Note: We have only one built-in and the "quality" hardwood is a generous description.